With roots all over North America the Malvinas are a feminist folk trio with a seriously original sound created by three of the most temperamental, romantic, down-to-earth, tolerant, funky, maternal, independent, impassioned, politically opinionated, completely-unlike-one-another, singer-songwriter-instrumentalists you’ve ever had the good fortune to know. 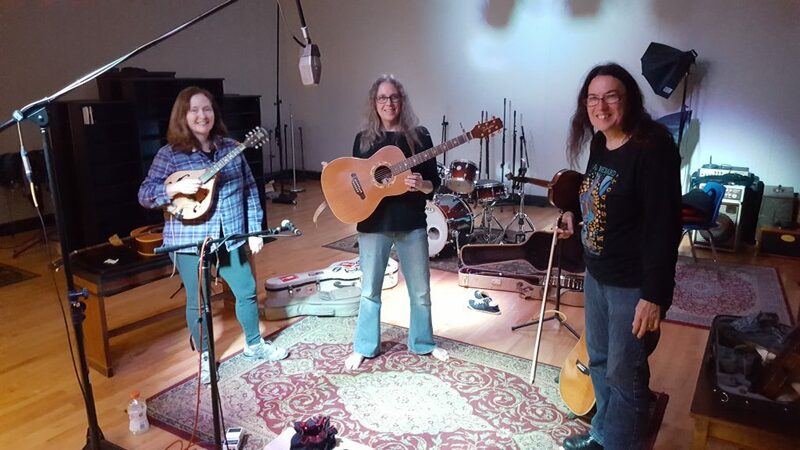 They are Lisa Markley, Gina Forsyth and Beth Cahill on guitar, mandolin, fiddle, banjo, killer harmonies, and a veritable smörgasbord of contemporary and traditional compositions that will have you coming back for more. Avec des racines ancrées un peu partout en Amérique du Nord – The Malvinas, trio féminin formé Lisa Markley, Gina Forsyth et Beth Cahill, possède un son sérieusement originel. Capricieuses, romantiques, terre-à-terre, tolérante, géniales, maternelles, indépendantes, passionnées, politiquement opiniâtres, et complètement différentes chacune des autres, elles travaillent dur:guitares, mandoline, violon, banjo, harmonies éblouissantes, et toute une gamme de compositions incluant : du blues du Sud profond, les saveurs épicées de la musique louisianaise, la musique celtique et la tradition des auteurs-compositeurs-interprètes. There is a distinct strength in women’s music and they tap into it brilliantly. Women with wide ranging influences…the Malvinas are serious and playful, often in the same song…The title cut was written by the trio’s namesake, Malvina Reynolds, in 1964. It is as poignant today as it was then with these lyrics: “God bless the truth that fights toward the sun.” One of the most fully realized folk albums of the first half of the year.